A multi-channel video and audio installation by Peter Bogers. 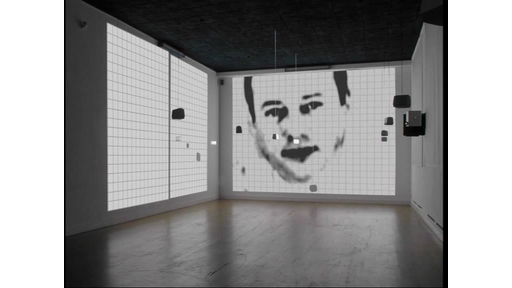 In 'The Unified Field', the viewer - who, as is more often the case with Bogers' work, first and foremost has to be the listener to fathom the different layers of his installations - is being spoken to by an abstracted face behind a grid. With a compelling, almost mesmerizing voice, the man tries to teach us something about our minds. He bombards us with scientific and pseudo-scientific terms. He says that the mind and the intellect are not the same, and are not even complementary; that the brain cannot experience itself and cannot concur with the mind that perceives. There is polyphony in our heads, and the parallel spheres in the brain are unable to come together. But, he goes on, each individual brain can have access to the universal brain if only we use the advanced techniques he mentions. If large groups of people simultaneously synchronized their positive thoughts by means of meditation, this could affect everyday reality and eventually become the solution to the crises and problems facing society. If we did our best, we would be 'spontaneously aligned with the unified field' and our 'thoughts and actions [would be] naturally aligned with natural law.' This illusion of the scientific which Bogers presents us with, is confronted by a large number of small loudspeakers which fill the room. They hang from the ceiling, spread around the room equidistant from each other. When you wend your way meandering among them and come closer by, you can hear a different voice singing in each of them. The songs they are singing are intimate and seem to be deeply rooted in their local cultural background. All these voices are interconnected by the intervals for breathing, which take place at exactly the same time. The grid that is visible on the video images moves in time to this rhythm of the breathing in and breathing out. In this way a 'field' is created, all the components of which are interrelated. When you stand still and shift your attention from the man and his message to the unified sounds, the separate voices together form an atonal chorus. What the man is so emphatically trying to tell us is interrupted, contradicted and in a way also confirmed by the singing Babylonian confusion.